Boost project work in multi-CAD engineering environments. CADMATIC is proud to announce full support for the Industry Foundation Classes (IFC) data format, the so-called IFC standard (see info box on overleaf for more). This means that CADMATIC models are interoperable with IFC standard compatible software product models, such as Tekla Structures. In practice, model import and export is handled with a simple one-button command, after which no further changes are required. From a development perspective, a clear advantage of standards-based integration is that it reduces the need for special integrations between software platforms. This saves costs and countless hours of development, testing, and discussions with users about the specifics of their use or different software platforms. 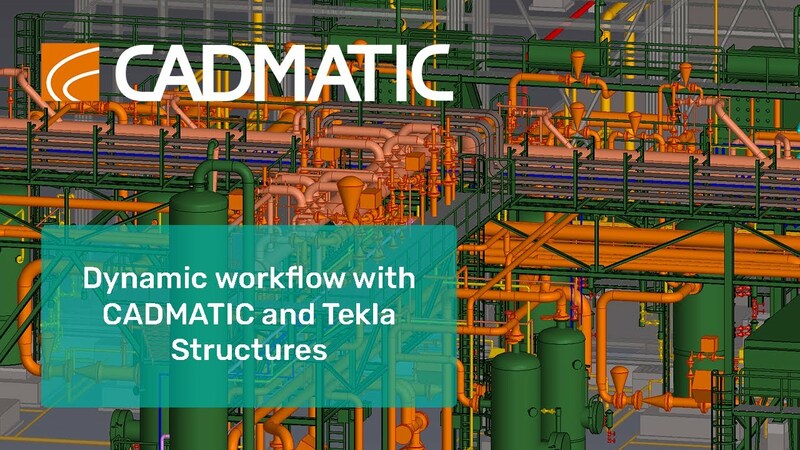 Software specifically designed to handle piping design, such as CADMATIC, can seamlessly be interfaced, for example, with software that handles structural design, such as Tekla. In essence, it allows engineering contractors to use the software platform of their choice, provided they support the IFC standard. As no information gaps exist, all parties have accurate and up to date information about the project status, which eases engineering and project coordination tasks significantly. Standard-based integration significantly eases project work in multi-CAD environments. Traditionally, this can be the source of much confusion or misunderstanding. With standards-based integration designers and proj­ect managers can rest assured that “what goes in comes out the same way”. After integrating data from different software platforms via the IFC standard, the combined intelligent 3D model contains all the information from the respective native software applications. Imported materials are recognized not as 3D shapes as in traditional space holders, but as real objects with all their related information, such as the materials and standards used, mass density attributes and so forth. The imported materials can be modified and exported for reuse with all the related information intact. As such, work can be started with a preliminary model in one software platform, after which it is enhanced with more detailed design in another. Follow the QR Code link to a video for an example of such a workflow: interface between CADMATIC and Tekla. “Openness and interoperability are two of the founding principles of CADMATIC software and as such support for the IFC standard was a natural progression for us. The seamless interoperability with other IFC standard compatible software vendors brings efficiency gains for designers and project management and eases data exchanges between parties involved in the design and production process,” says CADMATIC CEO Jukka Rantala. The IFC (Industry Foundation Classes) is an open, platform-neutral data format commonly used in Building Information Modelling (BIM) based projects. The IFC data model facilitates interoperability in the Architecture, Engineering and Construction (AEC) industry by allowing information to be received and sent between different platforms without making additional changes. Read more about IFC format here. Because of its focus on ease of interoperability between software platforms, several governments and governmental organizations require the use of IFC BIM in all projects. The IFC file format was developed by BuildingSMART, formerly known as the International Alliance for Interoperability. The IFC import license is automatically included in all CADMATIC seats, in version 2016Q2 and higher. The IFC export license is an add-on possibility for any 3D model seat in CADMATIC. Read more about other available interfaces here. 1. Exporting the CADMATIC model to IFC format. 2.Turning on the CADMATIC 2D plant layout in Tekla. 3. Turning on the CADMATIC 3D model in Tekla. 4. Converting CADMATIC objects to real Tekla objects. 5. The CADMATIC model has been converted to a Tekla structural model.